Autophagy is the regulated, self-degradative process of the cell that disassembles unnecessary or dysfunctional components. The lysosomal pathway is evolutionarily conserved and initiates engulfment, degradation and recycling of cellular contents including long-lived proteins and organelles thus promoting cell survival. 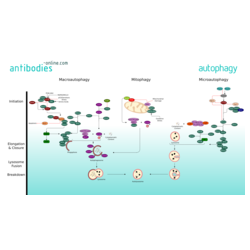 Autophagy is induced by conditions of nutrient deprivation as well as physiological and pathological processes such as development, differentiation, neurodegenerative diseases, stress, infection, obesity, and cancer. 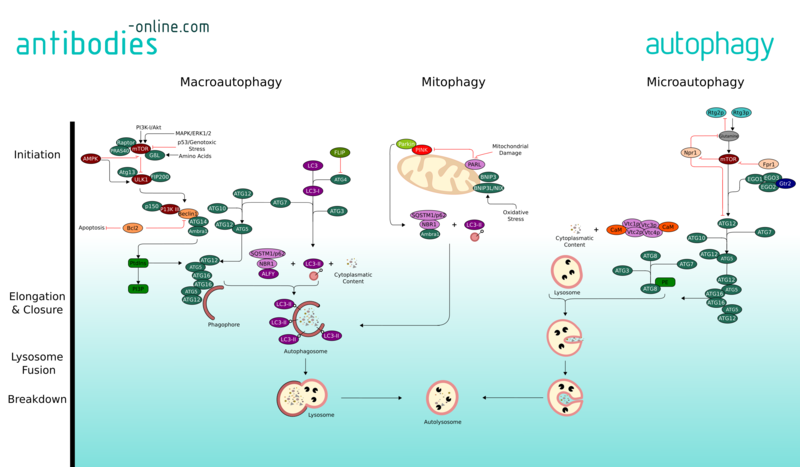 Three major forms of autophagy are commonly described: Macroautophagy, Microautophagy, and mitophagy, along with chaperone-mediated autophagy (CMA). Macroautophagy is the primary pathway and initiates isolation of cytoplasmic targets via a double-membraned vesicle - the autophagosome. The autophagosome then travels through the cytoplasm of the cell to a lysosome, and the two organelles fuse. Within the newbuilt autolysosome, the contents of the autophagosome are degraded via acidic lysosomal hydrolases. Macroautophagy is executed by more than 30 autophagy-related (Atg) genes. In mammals, amino acids, growth factors and ROS regulate the activity of protein kinases mTOR and AMPK. These two are crucial for autophagy regulation through inhibitory phosphorylation of the Unc-51-like kinases ULK1 and ULK2. ULK is part of a protein complex containing Atg13, Atg101 and FIP200 and phosphorylates and activates Beclin-1. The active ULK and Beclin-1 complexes re-localize to the site of autophagosome initiation, the phagophore, where they both contribute to the activation of downstream autophagy components. The class III PI(3) kinase complex mediates the nucleation of autophagosomes. VPS34 phosphorylates the lipid phosphatidylinositol and generates phosphatidylinositol 3-phosphate (PtdIns(3)P) on the surface of the phagophore. Downstream of PtdIns3P production, WIPI2B links PtdIns(3)P to LC3 lipidation through ATG12–ATG5-ATG16L1 (E3-like) complex. The two ubiquitin-like pathways of ATG8 and ATG12 induce the elongation and expansion of the phagophore membrane. Lipidated LC3 form of LC3, known as LC3-II, contributes to the closure of autophagosomes and enables the docking of specific cargos and adaptor proteins such as Sequestosome-1/p62. The completed autophagosome then fuses with the help of SNARE and UVRAG with a lysosome. The contents of the autolysosome are degraded and their basic modules are released from the vesicle through the action of permeases. Mitophagy is the selective degradation of mitochondria by autophagy. It is triggered by defective mitochondria following damage or oxidative stress. Mitophagy prevents cellular degeneration caused by accumulation of dysfunctional mitochondria. NIX and its regulator BNIP3 mediate mitophagy in mammals as well as PINK1 and parkin proteins. The occurrence of mitophagy is not limited to the damaged mitochondria but also involves undamaged ones. Microautophagy, involves the direct engulfment of cytoplasmic material and organelles, such as the peroxisome and the nucleus into the lysosome. This occurs by invagination, meaning the inward folding of the lysosomal membrane, or cellular protrusion. Chaperone-mediated autophagy differs from the other autophagic pathways as it does not involve vesicle formation but, rather, a direct translocation of a specific set of proteins across the lysosomal membrane. The cytosolic chaperone hsc70, plays a major role in target recognition and transport to the lysosom. Targeted proteins must have an amino acid sequence a with pentapeptide motif biochemically related to KFERQ in order to be bound by hsc70.